BOSTON (Reuters) - The massive data breach disclosed by retailer Target Corp last week is likely to teach its U.S. customers a painful lesson in payment card security and build support for an anti-fraud technology now sitting on the shelf. For years, U.S. merchants and banks have balked at adopting a well-established system that uses credit and debit cards that store information on computer chips. The technology, ubiquitous in Europe, Canada and elsewhere, makes it harder for thieves to misuse data compared with cards that store data only on magnetic stripes. The problem is the costs of the new chips and some 10 million payment terminals to process them. 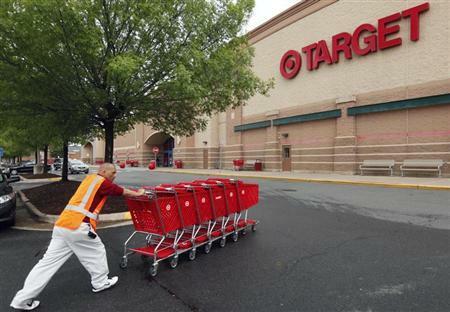 The delay may prove costly to Target's U.S. customers. The third-largest U.S. retailer said unknown hackers stole data from up to 40 million credit and debit cards used at its stores in the first three weeks of the holiday season. Now, after years in which U.S. companies tolerated fraud as a cost of doing business, high-profile breaches such as the one at Target are raising demand for increased card security. "There's no doubt in my mind it will happen over the next two years. The fraud risk is too high," said Rush Taggart, chief security officer of CardConnect of King of Prussia, Pennsylvania, which helps merchants process payments. "I think we all wish it had happened over the last four years." An early switch to the global card system may not have prevented the Target data theft but the chip technology would have reduced the value of the stolen data by making it harder for hackers to reuse the customer information. For one thing, the new systems are better at detecting counterfeit cards. Visa Inc has warned that merchants' banks may start bearing the costs of fraud starting in October 2015 if the merchants don't upgrade. In much of Europe, 94 percent of sales terminals use the chip system, according to a 2012 report by consulting firm Javelin Strategy & Research. The figure was 77 percent in Canada and Latin America. That compares with only 10 percent of U.S. sales terminals with upgrades. The report said the figure would still reach only 60 percent by Visa's October 2015 deadline. And the timetable could face delays if merchants push back on changes that banks and processors want but will not pay for. Retailers over the summer won a ruling from a U.S. district court judge in Washington that could help them reduce the fees that banks can charge for debit card transactions. Banks had counted on those fees to pay for extra network upgrades, and the uncertainty could put off further investment, said Al Pascual, a senior analyst at Javelin. "We should move to it," Pascual said about the new standard. "But 'should' and 'would' are two different things," he said. There are now nearly 1.6 billion EMV payment cards in use worldwide. Wells Fargo said recently its U.S. customers with the Visa consumer credit cards it issues may request a new card with a chip to use while traveling. "Today, very few domestic merchant terminals support EMV technology, so there is little need for a full-scale roll-out," a Wells Fargo spokesman said via e-mail. U.S. banks and merchants have tolerated the weak security in part because they are able absorb the costs, said David Robertson, publisher of the Nilson Report, a California trade journal that tracks the payments industry. In its August issue, Nilson said global card fraud rose to a record $11.3 billion in 2012, from just under $10 billion the year before. Nearly half the losses occurred in the United States, helped by the lack of the more advanced card readers. But on a volume basis the losses amounted to just 5.2 cents for every $100 that consumers put on payment cards, up from 5.07 cents per $100 in 2011. Those figures are insignificant for most of the players in the chain, Robertson said. "It's a very manageable cost," Robertson said. Organized shoplifting in comparison costs U.S. merchants around $30 billion per year, he said. Consumers, who are generally not held responsible for covering for fraudulent purchases, have had little incentive to push for change. But the rising fraud rates also mean more dangers of identity theft. Target said it was still reviewing how the attack was carried out, but experts expect that systems at cash registers were compromised. A Target spokeswoman did not respond to questions for this article. The incident appeared to be among the largest security breaches in retail history, though it fell short of the one announced by retailer TJX Cos in 2007, which was blamed on poor security in the wireless computer networks at TJX stores. Since then, retailers have upgraded their systems under what are meant to be the secure Payment Card Industry standards, or PCI, meant to cover existing magnetic stripe cards. But Gartner Research analyst Avivah Litan said many breaches since then have occurred at companies that officially met the standards. The problem is the magnetic stripe used to store data on most U.S. cards is not secure enough to begin with, said Litan, who favors upgrades to EMV. "PCI isn't working because it is attempting to patch an inherently insecure payment card system and network," she said. "We can't expect retailers to patch their systems to work around the weaknesses of this antiquated technology," she said. Nilson's Robertson said the rise of mobile phones as payment devices may complicate upgrade plans because they could crowd out payment cards. If that happens soon, companies may have wasted billions of dollars. "It would be like investing in improving silent movies when everyone else is moving to sound," Robertson said.